BSM ditches Fiat 500 for Vauxhall Corsa | What Car? The British School of Motoring (BSM) is ditching all 3250 Fiat 500s from its fleet and will switch back to Vauxhall Corsas from March 2011. BSM signed a four-year deal with Fiat in June 2009, but will start to remove 500s from its fleet from next spring. Instructors had complained the three-door Fiat 500 was too small, so BSM decided to make the switch to five-door 1.2- and 1.4-litre Vauxhall Corsas 'in recognition that instructors often use their cars not only as a tool for their trade, but also as their primary family vehicle'. Prior to the Fiat deal, Vauxhall had supplied BSM with cars for 18 years. Fiat was to have supplied 14,000 cars under the four-year deal. Chance to bag a bargain 500? 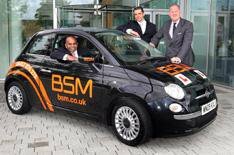 Used car buyers could find a sudden rush of Fiat 500s entering the second-hand market, depending on how quickly BSM disposes of its cars. The influx of used 500s could place buyers in a stronger position to negotiate a good price on the in-demand model. Buyers will need to inspect the cars for signs of extra wear and tear caused by inexperienced drivers. Look for damage to the wheels and consider a mechanical inspection to check the alignment of the wheels and the condition of the clutch.